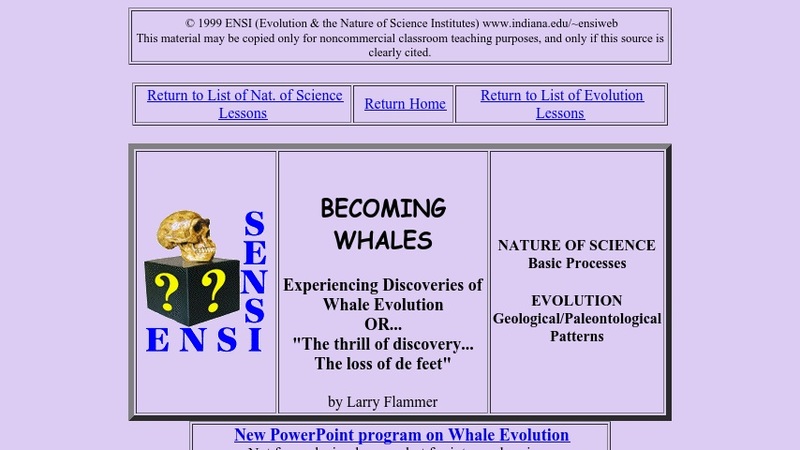 From the Evolution & the Nature of Science Institutes, this archived website contains a 45-minute lesson about evolutionary links between whales and terrestrial mammals. Through the lesson, high school biology students "experience the historical discovery of fossils which increasingly link whales to earlier land-dwelling mammals. This experience reveals how scientists can make predictions about past events, based on the theory and evidence that whales evolved." The lesson website contains concise sections addressing Principal and Associated Concepts, Assessable Objectives, Preparations, and Procedures. Downloadable materials for the lesson are provided as well. The site also includes a useful collection of Extensions and Resources.